Boricua Village, completed in 2009 is a new 4.5 acre educational, commercial, and residential community in the Melrose section of the Bronx; consists of approximately 9 buildings with 750 new residential units and up to 50,000 square feet of retail space. The campus setting includes underground parking, a large interior landscaped park, a performance amphitheater, private and public road and sidewalk improvements, new underground utility work, roads, and pedestrian walkways. The residential component’s seven buildings range in height from 6 to 13 stories, and are comprised of studios and one-, two-, and three- bedroom apartments. Boricua Village also incorporates a 14-story building that houses a new Bronx flagship location for Boricua College. The development jointly sponsored by Atlantic Development Group and Boricua College, is one of The Bronx largest and most ambitious community revitalization initiatives in recent years and will serve as an economic catalyst for the Melrose community. Oversaw all aspects of this project from inception through site improvements and foundation construction. Located on 20 acres of landscaped grounds, Palmer hill consists of 114 luxury townhomes, 81 condominiums a community clubhouse and underground and surface parking. J3 construction was hired to provide value engineering services to generate significant savings enabling commencement of the second phase of construction. Click here for more information on Palmer Hill Homes! Schaefer Landing, completed in 2006, is a mix of affordable rental apartments, luxury condominiums, retail, public and private park spaces, interior roadways, landscaped courtyards, private and public roof terraces. There is underground parking, a waterfront esplanade and a ferry landing. Responsible for every aspect of pre-construction planning, budgets, coordination and oversight of all land improvements, on and off-site road and utilities, environmental site remediation, and all aspects of construction. 1955 First Avenue, new 7 story luxury residential rental apartments, 235 units, 260,000 sf. Costas Kondylis, Magnus Magnusson Architects, $38,000,000. 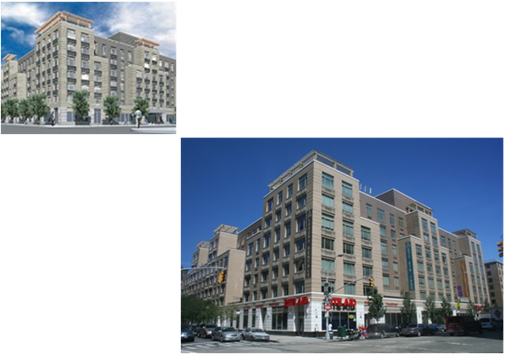 The Aspen, a newly constructed seven-story building with 234 apartments and over 15,000 square feet of ground floor commercial space, is located at 1955 Avenue, East Harlem and opened up to residents in October 2005. Amenities at The Aspen include a laundry facility, exercise room, game room, outside, 2nd floor Courtyard and a 110-car garage. Coordinated architectural and engineering teams through site improvement stage, budgeting and purchasing. See more information on The Aspen! 40 story 350 key hotel in midtown Manhattan. As Owner’s Rep, J3 was responsible for negotiating design and engineering consultants’ scope and contracts, value engineering, design development, budgeting, logistics and overall project scope. Many of the above in multiple locations.